Bohemia Interactive’s Make Arma Not War competition, which tasks modders with creating Arma mods for a chance to win up to €200,000, comes to a close at the end of this week, on the 26th. 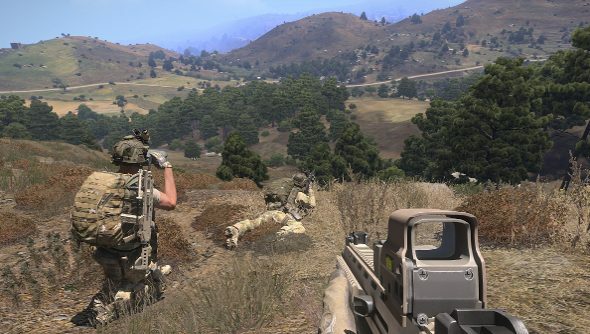 To make the end of the competition a wee bit special, Arma 3 will be completely free for the weekend, so you can check out some mods yourself, or simply pretend to be in the army on some lovely Greek islands. From now until October 26th, you can download Arma 3 on Steam and play it until you pass out, dreaming of military operations and flying a sweet helicopter. If you discover that it’s your cup of tea, and you’d like to keep playing, the game’s on sale as well, and you can grab it for 50 percent off. Conveniently, the sale will go on until the 27th, so you can wait until you’ve had the whole weekend to try it out. And you really should consider it, because it’s brilliant. It’s a great military sandbox, and the editor tool is, while a bit arcane at first, a powerful bit of kit.